Why is it that our roads and bridges are falling apart? Why is there not any immigration law that works? We can take them one at a time. Why is it that our roads and bridges are falling apart? First, there is a lot of federal money that is supposed to go to the States highway funds to repair roads and bridges. The Tea Party controlled House has held up those monies. Maybe if the people were to get out there and vote in November we could get the Tea Party voted out. Maybe then we would be able to make some progress. Why is there not any immigration law that works? Again, the Tea Party is holding up the legislation needed to fix the immigration problem! No progress has been made and no bills are voted on in the House ! Why is there no progress made by the veterans administration? Once again, no Bill has come out of the House. The Tea Party controls the Speaker of the House. So no Bills will be voted on. So who is to blame for the lack of progress? 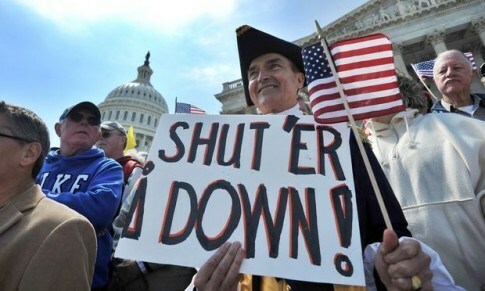 Who has cost us tax payers millions of dollars when they shut down the Government? Hmmmm, lets discuss these and other problems. I blame the voters who voted for the “Tea Potty”! If I’m wrong, tell me. If you agree, let me know. HI Nirek this is a 10 article for discussion thanks. DO you know how many jobs each state will lose if this is not funded. thousand to Millions. Hey republicans 40 % will be republic voters. How to pay for this? OH raise the gas tax? NO says the republicans who have not passed any jobs bills. The GOP Take, lets take it from your pension funds federal workers! You can even take from private corps and business. well that is more people who pensions are disappearing. NOT THEIR THOUGH. You can get billions dollars by cutting those no job producing GOP officials and all of those senators. They are all millionaires and YOU PAID FOR THAT also. Holy smokes!! MY oil company pension may not get paid in 3 to 4 yrs. Their are millions of people that live of their pension and SS payments. 40 % of those above are republicans. Hey lets lower all of congress pay and pension by 50 % even retired politicians. They are doing no work any way and mostly republicans. I will give Dems and independence’s a pass for now but some of them are to blame also. 40 to 50 billion will be saved if we do this. the house passes expensive bills, the senate fixes them. Then the tea party filibusters. This costs million more per day. They have been doing this for 5 1/2 yrs. that is 100’s of billions of dollars an estimated 500 billion. That is money we the USA went in debt for and borrowed money to pay. Immigration 5 yrs and not one bill passed on this. Heck if they where in a corporation the GOP guys would be gone. filibusters GOP more then 400. The Dems and Indy’s maybe ten. OK pres powers used Obama a whopping 30. all GOP presidents many more. How many talking points of the tea party are real?? ONE they try to pass religious bills cost billions of more wasted federal and state taxes. For 5 1/2 yrs all the tpGOP is doing is pure waste of federal and state taxes . Lets not forget we need to raise the minimum wages so we can spend to boost the economy. Hey republicans 40 % are republicans that need a raise. Last but not least!! All those 3 million plus soon to 6 million by the end of the year not unemployment extension at no debt to the USA. Bush 2 did it 3 times or more with no cost offset. Hey republicans and all the rest getting ZIPPO dollars. Your struggling and dipping into you life savings. Low and behold 40 % are republicans voters are in this situation along with all the rest. IF it create now debt why don’t we pass this! Guess what YOUR hard earned SS taxes pay for it. YOU know the Taxes that the congress does not pay. Simple logic vote the TPGOP candidates out. Come on moderate republicans you must do this to STAY A viable political party. Ghost, I am all for lowering their pay and benefits by 50% or more as long as they continue doing nothing. Prosper in the music you love the best! Nirek, I also blame Tea Party voters and — just as much (if not more) — I blame people like the Kochs and Sheldon Adelson for supporting and financing them. Some gullible people hear inflammatory rhetoric about their “freedoms being taken away by a tyrannical government” and have a knee jerk reaction, then vote based solely on a fear that someone is going to come and wrench their six-shooter out of their cold and almost-dead hands. But it’s the people who are putting that rhetoric out there — on hate radio, on FOX “News” and even on more traditional MSM sites (Our local NBC affiliate aired a story on the 11 p.m. news last night that was an alleged “investigation” into whether or not the President was “acting more like a king than a president.” Really?) -- who get those angry paranoid feelings cranked up. And there are corporations behind those “news” outlets as we all know so well. I read that, too, and completely agree with you. Another heartening trend, a sizable group of Republican pols in Kansas, some of whom were mowed over by the Club for Growth or one of those oxymoronic groups just announced they were supporting the Democrat over Brownback, whose fiscal “experiment” has had devastating effects on the economy and education. Another self described moderate is challenging a tea partier in office. It’s one thing for progressives to despise the tp’s, but in the end, it has to be the gop moderates who remove the tumor. That story should be put out for everyone to see. That was a great article Kesmarn…I believe every republican, no, every person in the electorate with the ability to vote should read that article. Where are people like this on the evening news? I’m certainly glad he finally realized just how he was hurting himself and his family by voting for those who would keep him in poverty no matter what he did. ~~~~~~~ Martin Luther King Jr. Thanks for the link Homie! An article that all poor and low income conservatives should read. It used to baffle me that these same people continued to support a party that cared nothing about them, at the expense of their own well being. Now I know why they do, but it’s still a curiosity to me. Thanks, KT and SLM. I was intrigued by the fact that the more education he got, the more he was able to see through the lies and logical fallacies. And as he became more affluent, he grew more compassionate. So interesting. I also think that education goes a long way in turning a conservative into a more compassionate, liberal. The author also realized just how much good government helped him make a better life for himself and his family. Thankfully, he was humble enough to admit this, publicly. Right! And — wow — that takes courage! Kes, great link. I too wish he could shake all those people up and wake them from their zombie-like state. I blame the Koch Bros. They bought the candidates and the voters with their scary ads. I blame the voters who are so stupid they vote against their own best interest. These are the same people who were duct taping their homes post-9/11. I blame the money over people culture cultivated by the Rs since the 80s. I blame the churches that no longer preach Jesus’ message and instead care only about all that tax-free money rolling in. I blame the lobbyists for selling their souls and ours along with them. I blame myself for not leaving this country when I still had the means to do so. Great article Nirek, looking forward to seeing others’ comments. Great post sillylittleme. I agree fully. OH two new songs up! Tones & modulations is flat out synthesizers VIA Rick Wakeman style’. Thanks RSG, I will check the tunes out. I was wondering if some of your music was inspired by the atonal movement or something other than electronic music. Tones & modulations is not a tonal totally. It is the song i got my minor in music with. There are only single note runs and Two note intervals in it. NO chords 3 of more notes of any kind. Yes there is an atonal part that is the wind and Oscillator modulations noise as the synthesizers fade out!! I hope you enjoy it. If you like synthesizer music you have a good chance. Loved the new tunes. Nice vocals on Little White Lies!! Yea the vocals are Gary Swann and me. The millionaires was a popular band in Denver most of Colorado and Wyoming from 1978 to 1982.